Why: Pretty fabric, easy and flattering pattern – get in my wardrobe! Review: Blogged here. Pattern review here. Why: Because I need stuff to wear to work that isn’t a giant polka dot-printed taffeta party dress! Why: You know those patterns you fall in love with? That’s this one. And it totally lived up to my expectations! Why: The pattern promised great things – “learn to fit a full bust” – and I was easily persuaded. The blouse is great for work and I LOVE the button-up back. Now I’ve nailed the fit I’ve got a good pattern for work wardrobe staples. Why: A great, easy-to-sew and flattering skirt pattern I have been eyeing off for years and finally got my mitts on. Perfect for beginners or the seamstress who wants a quick project! Why: This is one of the first patterns I purchased when I seriously got into sewing and I’d just been waiting for the perfect fabric. I wasn’t sure how this would turn out (I rarely wear these colours), but I’m happy with the result! Why: Because I planned on going to the races and where else would I get an excuse to wear such a classy vintage dress?! Why: I made one before and think it’s a great pattern and great wardrobe builder! Why: Stash-busting the ponte I had remaining after my red Elisalex. Why: My charcoal Elisalex has become a wardrobe staple and now it’s gotten to the point where I just want the same thing in different colours! I have swapped the pattern’s tulip skirt for a self-drafted circle skirt. Why: Because I had this pattern in my stash from when I started sewing and it seemed perfect for me – easy, custom cup sizes, vintage-inspired design. I am not as much a beginner these days but I thought it would be a relatively simple project. It was, I just chose challenging fabric! Why: I love a good shirtdress and this pattern was one of the things I’ve been keen to sew a few things from Gertie’s book. Why: I wanted to make the perfect pencil skirt out of the perfect vintage silk suiting and this was my muslin – it turned out very nicely compared to some of my other hideous muslins, if I do say so myself! Why: I loved my first Elisalex and I wanted to make a more casual, super comfy dress using the Elisalex bodice. Why: Because I fell in love with the pattern as soon as I saw it and dresses with fitted bodices and poofy skirts are my ultimate. Cick here for posts tagged with Elisalex and to see more pics. Click on image for more pics. Why: Blue and white sleeveless shirt dress – testing out the automatic buttonhole on my first machine! Why: To learn how to sew and be awesome at it! 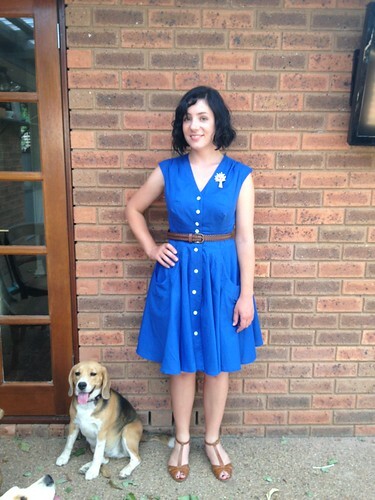 Completed: July 2012 – the second dress I’d ever made and one of the few I actually wear! Review: Pattern Review here. Blog post (and musings on why sewing is awesome) here. More to come when I take pics!